How about starting your day with some healthy porridge? This oats porridge recipe is made tastier by adding seasonal fruits and nuts to get the added nutrients. A bowl of oatmeal with cinnamon and honey will boost your health and eating oats has many benefits for weight loss and optimal health. Seasonal fruits, cinnamon and honey bring in the added flavour to your oatmeal porridge. 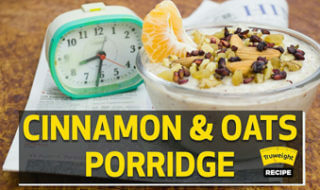 The cinnamon and oatmeal recipe is great for quick weekday recipes before work. Take water in a bowl and add oats to it and stir. Add cinnamon powder and milk to it. Cook them. Add walnut, almonds, raisins and honey to it. You are now ready to serve your healthy bowl of creamy cinnamon and oats porridge.